You know the feeling! If a heart design could skip a beat, these would skip right off the page! The vibrant, swirling heart designs come to life on this bright white, z-fold invitation. A custom quotation of your choice is printed on the third panel at no extra charge. The heart design and all wording is printed in a single ink color of your choice. Please specify names and quotation. Paper weight is 56 lb. Inner and outer envelopes are included. Everything we expected and more!!!! I saw this invitation on theknot.com and loved it immediately. Ordered quite a few different sample invites but nothing compared Ann's was by far the best. Well made and colors are perfect. Delivered on time as promised. This invitation was a very nice invitation and at a great price. The bride and groom were very please with the outcome. Very nice product, packaged very well!! Wish I could shop more, however never again - due to ridiculous shipping! The delivery was print, but the way they shipped it to Canada, I owed a ton of money upon delivery, that I was completely unaware about! - very unfair, and I won't shop with you again because of it!! After researching the costs, they could have hipped with a different company other then ups and those fees wouldn't have happened!! Cost me over 100 dollars on a 300 dollar purchase!!! 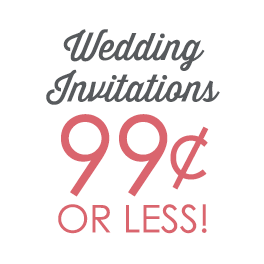 Love these invitations and the price. Absolutely love these invitations. Love that you can add your own verse and customize to your specification. The shipping was amazing. Ordered and received all in the same week. Great Job!!! Love the way they turned out and that I was able to personalize them to make them as unique as possible!!! Will be back to buy all my invitations from here for now on!!! Simple, easy, personalized and inexpensive! The invitations look just like the picture...no surprises! I was able to combine the invitation and reception card all into one. Would definitely purchase more invitations. I used this as a wedding invitation:) The printed ink came out diffferent then expected. I love the metallic texture of the silver. The silver is partial of my wedding theme, which is close enough. I wish I could've done more to make it personalized and unique. Such as choose different colors for the text and the pictures and be able to change and/or move the pictures. All in all it was a great purchase...the design was elegant but simple and the price didnt burn a whole through me and my Fiance's wallet. I had a freind make me invitations, snd they didn't turn out the way I thought. I started to look through website after website and found some that were ok. Then I came across this one and I fell in love with them. It is such a simple sweer design. This was a great buy! The material its printed on is great and the color is stunning! I love my invites! I ordered them a few weeks ago for my upcoming fall wedding [...], they were so beautiful! I was very worried about ordering them from online instead of going to a local shop but there was nothing to worry about at all! My fiance loves them just as much as I do! I can't wait to send them out to all our guests! Ordered these invitations for my wedding. they were perfect! everything was printed correctly. wish i would have used a little more color. I was the first invite I'd seen, loved it and then purchased.....family and friends loved them as well. Many quests said they liked the design and the wording. Would easily recommend. These invitations are simple yet elegant. The card is made of thick quality paper and the raised ink gives the card elegance. I loved the way the cards all turned out. Nothing was damaged and there were no errors. I would use annsbridal again. [...] Loved how they came out!